﻿Socio-Economic Rights of the Rohingya Refugees – Is India even doing its duty towards refugees? 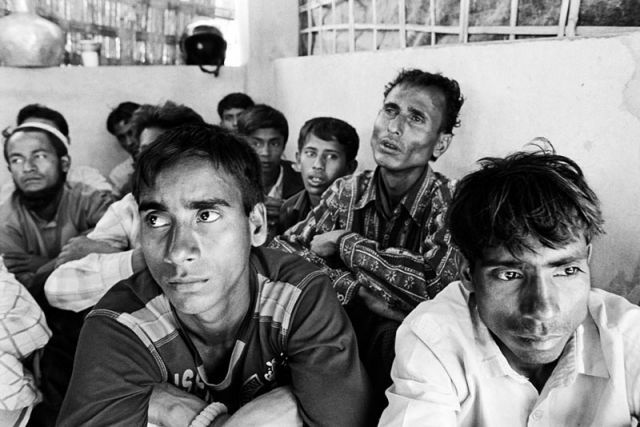 India is currently hosting more than 2 lakh refugees, including a large number of Tibetan, Sri Lankan and Rohingya refugees even though it is not a party to the Convention relating to the Status of Refugees, 1951 (The Refugee Convention, 1951). One of the most frequently used arguments for not acceding to this convention is that India already does its duty by hosting a large number of refugees, more than any other South Asian country. While Article 14 of the Universal Declaration of Human Rights (UDHR) provides the right to seek and enjoy asylum from prosecution, it is pertinent to understand that providing asylum is not merely restricted to allowing the refugees to stay in the country. This right necessarily extends to ensuring that the refugees are provided access to basic amenities and services in order to live a dignified life. Therefore, India’s argument that it is already performing its duty towards refugees without signing the refugee convention, will not sustain unless the refugees in India enjoy basic human and socio-economic rights. If India’s stance on hosting refugees has to be analyzed, it is also crucial to understand the manner in which Rohingya refuges are treated in India. While Sri Lankan and Tibetan refugees are specifically identified and supported by the Indian government Rohingya refugees completely rely on the aid provided by the UNHCR and other NGOs. Socio-economic rights have been specifically provided under The Refugee Convention, 1951 as well as the International Covenant on Economic, Social and Cultural Rights (ICESCR). India, being a party to the ICESCR, is bound by the International Human Rights Law to ensure that basic support is provided to all refugees in this regard. These rights include but are not limited to providing basic amenities, education and employment opportunities. Most of the Rohingya refugee settlements lack basic amenities such as shelter, food, safe drinking water, proper sanitation, access to hospitals etc. Employment opportunities (even as daily wage labor) and access to hospitals is denied as the employers and hospital staff demand Aadhar card (Unique Identification Card). Public Distribution System – According to Article 20 of The Refugee Convention, the refugees must be treated in the same manner as nationals for distribution of products in short supply. In Indian context, this essentially means that refugees will be able to benefit from the existing public distribution system for ration at a subsidized price if India accedes to the convention. Currently, no such assistance is provided to the Rohingya refugees. Education – Article 22 of the The Refugee Convention provides that the refugees must be provided elementary education similar to the nationals and other education in a manner not less favourable than that accorded to the aliens. Similarly, Article 13 of the ICESCR requires the States to provide free primary education to everyone, which also includes the refugees. However, schooling of Rohingya children is majorly handled by various NGOs across India while only some could avail the services of government schools as Aadhar cards are demanded from the children. As per Article 21 A of the Indian Constitution, free education should be provided to “all children” in the age group of 6 to 14 years and this is definitely inclusive of refugees residing in India. Providing primary education is one of the essentials to work towards ensuring that the next generation can become self-reliant by enhancing their employability factor. Implied Non-Refoulment – The principle of Non-Refoulement refers to an obligation of the host State to not send back the refugees to a place where they could be persecuted. Over the years, States which are signatories as well as those which are non-signatories adhered to this principle as a norm at myriad instances and it has thus gained the status of Customary International law. India has adhered to this principle for nearly 70 years until recently when they deported 2 groups (7 and 5 individuals) of Rohingya refugees to Myanmar within a span of 3 months. However, Non-Refoulement shouldn’t be understood in a restricted sense and must necessarily include the protection of basic rights of refugees in the host country. Only then the host country can be considered to be conducive for refugees to live till one or more of the three durable solutions (Voluntary Repatriation, Resettlement, Local Integration) are implemented. These are the basic socio-economic rights and can even be termed as the obligations of “implied non-refoulement”. As India is clearly not inclined towards working for the local integration of rohingyas as a durable solution, the only other durable solutions are Voluntary repatriation and resettlement in a 3rd country. As the situation stands, the rohingyas still live in a fear of persecution and hence repatriation should not be resorted to before ensuring that the Rohingyas will be safe in Myanmar. In order to work towards durable solutions, safeguarding the basic human rights of rohingya refugees during their stay in India and equipping them with elements of self-sustenance through meaningful interventions should be considered to be a priority if Indian government really wants to assert that it is doing its duty towards refugees. Indian government is evidently failing to provide them with any kind of support to facilitate their stay till they could be voluntarily repatriated or resettled. It could be argued that the Indian government treats the Rohingya refugees as illegal immigrants and hence it does not provide any kind of support. However, this argument can be refuted by relying on the fact that Rohingya refugees fall under the definition of refugee as per The Refugee Convention, 1951 and are also recognized by UN as the “most persecuted ethnic group”. Considering these developments and analysis, the Indian government should stop relying on the argument that it is already doing its duty and accede to the 1951 Convention so that uniform and comprehensive protection can be made available to all the refugees in India till they are voluntarily repatriated or resettled in another country.